SAN PEDRO DE ATACAMA, Chile , Sep 22 2015 (IPS) - Chile’s altiplano or high plateau region, pounded by the sun of the Atacama desert, the driest place in the world, is home to dozens of indigenous communities struggling for subsistence by means of sustainable tourism initiatives that are not always that far removed from out-of-control capitalism. 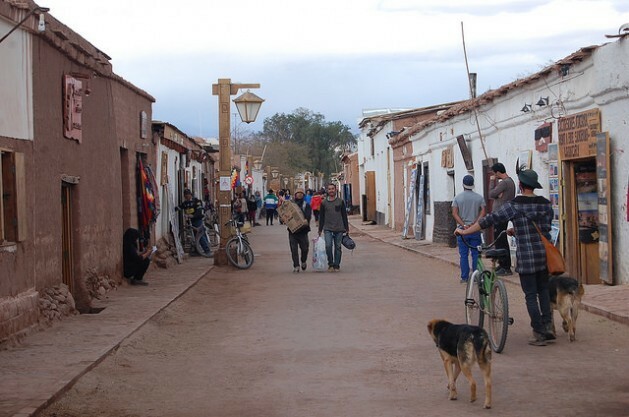 San Pedro de Atacama, the capital of tourism, archaeology and astronomy in northern Chile, is home to 4,800 people, 61 percent of whom belong to the Atacameño indigenous group, who refer to themselves as Lickantay in their Kunza tongue. But during tourist season, hundreds of thousands of visitors come through the town, especially people from other countries drawn by the mysteries of the desert, its volcanoes and geysers. The desert also offers some of the clearest night skies on the planet, and in the Atacama Large Millimeter/submillimeter Array or ALMA Observatory, scientists are working to decipher enigmas of the night sky. This small highlands town, located at 2,600 metres above sea level and 1,700 km north of Santiago, received over 1.6 million visitors from Chile and abroad in 2014, according to National Tourism Service statistics. Tourists are awed by the stunning, unique landscape of salt flats, dunes, rock formations, geysers, thermal waters, crystal clear blue lagoons, canyons and snow-capped mountains. In fact San Pedro de Atacama, in the northern region of Antofagasta, has become the leading Chilean destination for foreign tourists. But there is well-founded concern in some sectors that the uncontrolled flood of tourists in the area will damage the diverse ecosystems in the municipality of San Pedro de Atacama, which covers 23,439 sq km. The municipal authorities, together with the regional government, have launched several initiatives aimed at ensuring sustainable development. One was the Project on Ecosystem Services (ProEcoServ), financed by the Global Environment Facility (GEF) and implemented by the United Nations Environment Programme (UNEP). The project was extended to 2014, with 1.5 million dollars in financing. It consisted of generating tools for the assessment and economic valuation of ecosystem services. In May a group of local residents completed a training in renewable alternative energies that could help solve the municipality’s electricity problems. In July, 14 hotels, hostels and restaurants received the “Clean Production Agreement” certification, which foments environmentally friendly practices such as sustainable management of solid waste and efficient water and energy use. “All planning or studies indicating how we can do better and raise awareness of what we have and what is happening in the ecosystem are valuable,” San Pedro de Atacama Mayor Sandra Berna told Tierramérica. “I would like people to be more aware, to understand what science and studies say about our ecosystem,” she said. Despite the progress made, the small centre of the town is packed with businesses offering tours to the main local attractions. And in the wee morning hours on any given day in tourist season you can see a long line of headlights of cars winding their way up to the El Tatio geysers, one of the principal tourist attractions in the area, which receives an average of 100,000 visits a year. El Tatio, which in the Kunza language means “grandfather who cries”, is a field of 80 geysers located at 4,200 metres above sea level, 97 km from San Pedro de Atacama. It is the largest geyser field in the southern hemisphere and the third largest in the world, following Yellowstone in the United States and Dolina Giezerov in Russia. Since September 2014, this natural marvel has been administered by the indigenous communities of the highlands villages of Toconce and Caspana, through a 30-year “free use concession” granted by the government of President Michelle Bachelet. 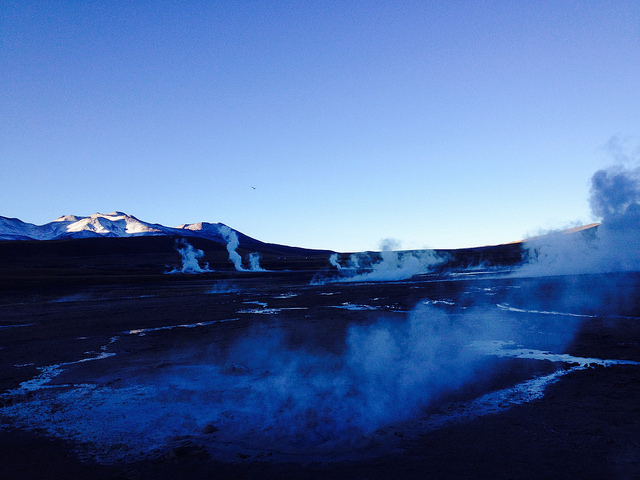 Tourists from Chile and abroad pay an entrance fee to visit El Tatio. But in addition, leaders of the local indigenous communities charge nearly 1,000 dollars for an interview with the press. “That’s because this is then published around the world, and it’s you people who earn the profits,” the mayor of the village of Caspana, Ernesto Colimar, told Tierramérica. Contrite, Luisa Terán, an Atacameño Indian from the same village, hastily clarified that this was an isolated case. “There are people here who are mad about money, but not all of us are like that,” said Terán, who along with her cousin attended a course in India to become a “barefoot solar engineer” and installed the first solar panels in Caspana. “Most of us work hard for a living and try to protect our community,” she told Tierramérica. The majority of the highlands villagers in Chile are family farmers who grow their own food and raise llamas, vicuñas and guanacos. In communities like Caspana, 114 km from San Pedro de Atacama, local residents still use pre-Hispanic farming techniques, such as terraces. 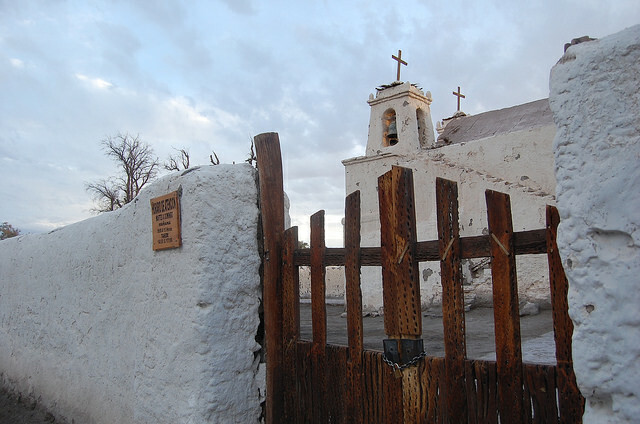 Others, like the town of Chiu Chiu, have more limited tourist attractions, like the local church, although it was left nearly in ruins by the 2007 earthquake that hit Antofagasta. Along the road between El Tatio and San Pedro is found Machuca. Although it is nearly a ghost town, it is an obligatory stop for tour guides. Located 4,000 metres above sea level, in the hamlet of 20 houses there is one church, the main attraction for tourists, who buy traditional llama meat “anticuchos” or kebabs and goat cheese “empanadas” or hand pies. The village has only a handful of residents, and is kept alive to receive tourists. Members of the families who used to live here take turns coming up to attend the visitors. Only the buildings and landscape can be photographed: to take pictures of the members of the community, you have to pay. “All of us want tourists to come, of course; you tell me what community wouldn’t want that, if it means more investment and if it means people could come back,” Terán said. “Our peoples are almost destined to disappear, because every year dozens of families go to the cities so their children can study, or for work, so this would help us survive,” she added. But “no one wants their town to become what San Pedro de Atacama is now, because that is the other extreme,” she said.